Hemp and marijuana are both derived from the cannabis plant. The distinguishing difference between hemp and marijuana is the amount of tetrahydrocannabinol or THC in the plant. THC is the cannabinoid responsible for the euphoric high due to the psychoactive properties. A marijuana plant will have from .5% to 30% THC depending on the strain, whereas a hemp plant by definition has less than .3% THC. Hemp, like medical marijuana, contains cannabinoids, which are known to possess therapeutic properties. In addition to CBD, hemp also contains beta-caryophyllene, a substance found in many culinary herbs that help control inflammation. Hemp can be ingested, smoked, or used topically for pain relief and many other medicinal purposes. 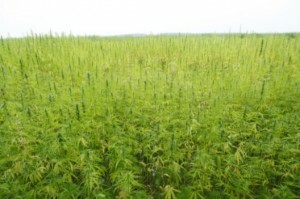 The entire hemp plant is usable. The root of the plant contains beta-caryophyllene (BCP) and terpenes which provide anti-inflammatory and antioxidant properties. Today, hemp root is formulated into powders, teas, oils, serums, creams and salves. Though several promising changes in legislation have made hemp and hemp root products more accessible to the public, the use of hemp root actually stems back thousands of years. Hemp has been cultivated as a crop for over 10,000 years. Some believe it deserves the credit for starting the agricultural industry. Originally, hemp was used only for industrial purposes, and it would not be until approximately 6000 BCE that the Chinese would begin using various parts of the plant for food. The first account of the Chinese using hemp for medicine was recorded in 2700 BCE. Though the entire plant was used, the root specifically was harvested for its healing properties. They ground the powder into a paste to use on broken bones and injuries. A juice extraction was even used for post-partum pain. Medical cannabis and hemp also had a place in ancient India. Scholars have discovered that Indian medicine men used cannabis to treat ailments such as headaches, migraines, gastrointestinal disorders, as well as generalized and localized pain for thousands of years. Cannabis can even be found in The Vedas – the sacred Hindu texts – dating as far back as 2000-1400 BCE. By 79 CE, the ancient Greeks and Romans were using hemp root both in a raw and boiled form to relieve joint pain, gout, and other inflammatory disorders. Over the centuries, word spread throughout Asia and Greece of the healing properties of hemp root and by 1500 AD it had made its way to central Europe. In the 18th century, the English were using hemp root for sciatica and inflammatory disorders. Early New World settlers were growing hemp for industrial purposes back in the 1600s. Medicinal use began in about the 1730s. Hemp was a popular ingredient in healing tonics and medicines in the U.S, throughout the 1920s. Following the prohibition of alcohol, hemp was prohibited in the U.S, in 1934. The decades that followed would bring much controversy and legislative battles, mostly being won and lost at the state level. The cultivation of hemp specifically for the use of the root became popular in South America in the 1960s. Where legally permitted, it is also a thriving industry now in the U.S. The caring of the plants to ensure a healthy and productive root system is a very meticulous process. The root powder is used to make balms and creams. The root is also cooked and processed to extract essential oils. The oils are transformed into topical serums. The topical products are useful in reducing pain and inflammation. They work at the cellular level to send a signal through the DNA to turn off the acid causing the inflammation. Hemp root in topical form is very safe. Of course, as with any essential oil, the oil should not be applied to the skin undiluted. The hemp oil or serum will be mixed with other beneficial ingredients to create the final product. Ingested hemp root products are also, for the most part, safe. However, too much hemp oil can cause digestive or absorption problems, so the use of hemp oil for cooking should be limited. There are some toxins in large quantities, so – as with tea – it should be limited. Consuming hemp orally should also be avoided if one is taking medication for blood clotting. Hemp is a remarkable product used as a nutritious food source, medicinally, and also industrially to make textiles and clothing. Research is also underway indicating that hemp may very well be an environmental substitute for plastic. Hopefully, the legislative advancements will continue allowing society to use hemp in a variety of beneficial ways.